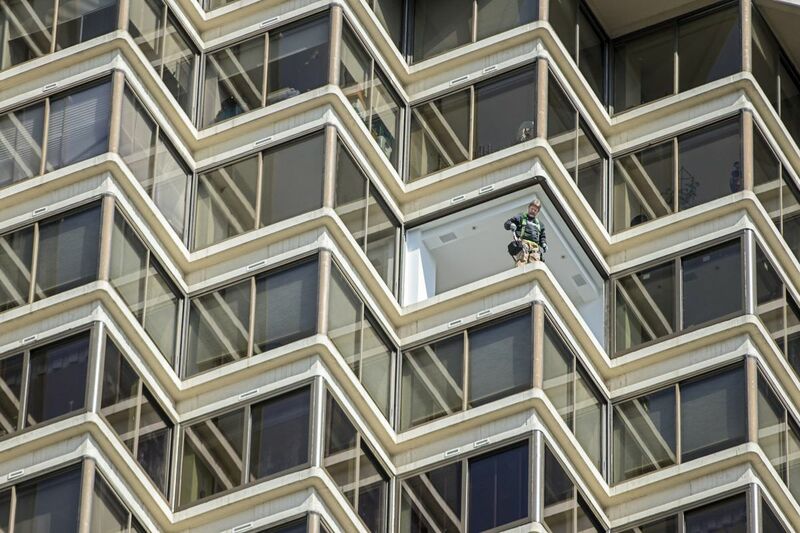 A construction worker on one of the top floors of The Rittenhouse. In Pennsylvania, construction is the only industry that has “worker misclassification” protections built into it. What do construction workers, delivery drivers, and exotic dancers have in common? They're all likely to be classified — incorrectly — as independent contractors by their employers. People in the labor law world call it "misclassification," a jargony term that might make your eyes glaze over but that should have you paying attention: The practice is a way for companies to employ workers without paying payroll taxes and benefits like health care and overtime, as they would for a salaried employee. And independent contractors don't have the same protections, such as overtime and workers' comp, that traditional employees do. And though it's been a labor issue for decades across all types of industries, recent federal changes and the explosion of the gig economy — in which workers take on jobs as freelancers — have made it a hot topic again. This week, the California Supreme Court issued a ruling that will make it harder for employers to classify their employees as independent contractors, leaving observers to wonder how the decision will affect companies like Uber and Lyft, which have built their businesses on the independent contractor model. The California decision is similar to a 2015 ruling by a federal judge in New Jersey, where the law is very favorable toward employees. "Independent contractors don't exist in New Jersey, people say," said Denise Keyser, a labor attorney with Ballard Spahr. In New Jersey, employers face "a real uphill climb" if they're in court over a worker misclassification case, she said. Though that doesn't always stop companies from misclassifying workers: On Thursday, New Jersey Gov. Murphy signed an executive order to investigate companies that aren't complying with the law, saying the practice could be costing the state more than $500 million in lost taxes annually. Pennsylvania is not as employee-friendly as New Jersey or California — though there is a law on the books when it comes to the construction industry. Signed by then-Gov. Ed Rendell in 2010, the law imposes fines on employers who misclassify construction workers. It was cheered by trade unions and scorned by employers, who said it would make it harder for new businesses because they often start out by using independent contractors. In the Philadelphia area, Andy Santillo, a labor lawyer with Winebrake & Santillo in Montgomery County, says that he hasn't seen an uptick in worker-misclassification cases, but that because of the headline-grabbing nature of some of them — the Ubers, the Lyfts, the Grubhubs — many people are examining these issues more closely. And because the Trump administration has taken an antiregulation stance when it comes to businesses, we'll begin to see these decisions fall to the states, Keyser said, as more lawsuits around the issue crop up nationally. At the same time, bills have been introduced in at least eight states that presume workers are contractors if they find their work through online platforms like TaskRabbit or Handy. "If you'd like to avoid being in court, as most employers do, you need to be conservative about how you classify employees," she said.